Loquat fruits look and taste a bit like apricots. They are slightly exotic with many health benefits and they are up and coming in the fruit world. 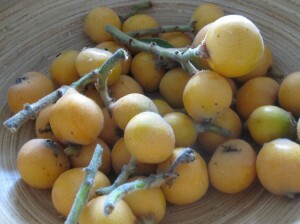 Loquat fruits taste sweet and sour. Sweet foods strengthen or increase the body’s resources. Sour foods astringe, hold in or protect the body’s fluids. Together, sweet and sour make ‘yin’ or moisture in the body. In the case of loquat fruits, it is the resource of ‘yin’ or healthy body moisture that is increased. Sour foods also sometimes affect the flow of energy or ‘qi’ in the body because sour tastes can stimulate digestive and other enzymes. Loquat fruits have a neutral or balanced energetic temperature effect on the body (not warm or cold). Their balanced nature makes them easy to use for people who have both hot and cold conditions. In terms of western nutrition, the loquat is low in saturated fat and sodium, and is high in vitamin A, dietary fiber, potassium, and manganese. I just made a delicious loquat chutney with the help of my sister, my kids and several of their friends. Having a group of 6 of us to peel off the skin and remove the seeds was a blessing because that work of obtaining the fruit is a bit time consuming. I started with a base of rice vinegar, rock sugar and maple syrup. Then I added dried mulberry fruits, dried red dates, raisons, sliced apples and a melange of delicious spices (freshly grated orange peel, cardamon, ginger, curry, chili powder, saffron, salt and pepper). The result was a delicious chutney that stimulates the digestive system, moistens dryness, aid the lung and liver. Here’s the basic recipe. Written by Lana at 1:18 pm and filed under Miscellaneous. « Almond Milk – tastes better when you make it yourself! Hello, your articles here Loquat Fruits – healthy exotics | In Good Health Blog to write well, thanks for sharing! I’m thoroughly enjoying your blog. I too am an aspiring blog blogger but I’m still new to the whole thing. I really appreciate it. Thanks for the tips you talk about through this blog. Wonderful site. A lot of useful info here. I am sending it to a few friends ans also sharing in delicious. And obviously, thanks for your effort!